The Mekong Delta is extremely vulnerable to climate change impacts due to increased temperatures, changing weather patterns, and especially sea level rise, as the Delta is a low, flat terrain with elevations less than two meters above sea level. In addition to the natural environment, the livelihoods and economy are also threatened by these changes. A recent four-week study abroad program helped put this into clear perspective. The following collection of images highlights not only vulnerabilities to climate change, but also the implementation of adaptation and mitigation strategies. 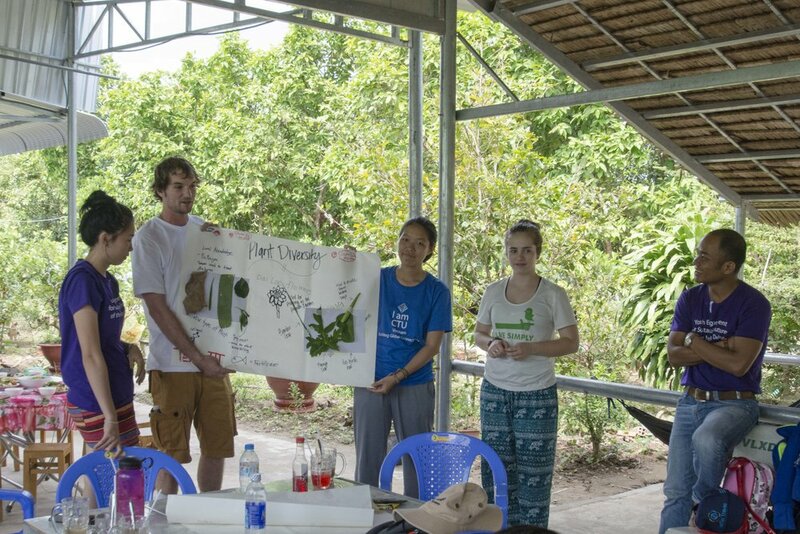 As a whole, this story is aimed to both share the strong connectedness I discovered between the people and the environment of the Mekong Delta and help people apply a similar connection between humanity and natural ecosystems on a global scale. 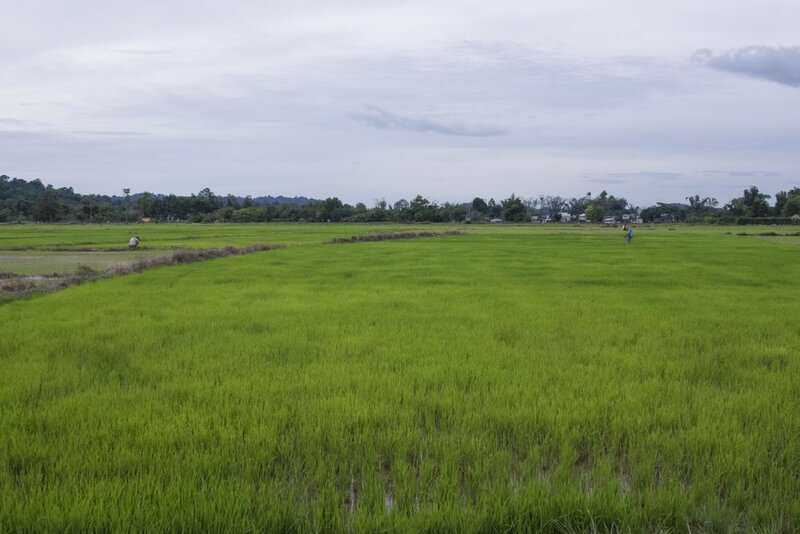 Changing weather patterns and salt water intrusion due to sea level rise are already causing complications for crops in the Mekong Delta, especially rice, which is a staple food source for Vietnam and other Southeast Asian countries. Last year was the worst drought in 90 years for many regions within the Delta. The increased risks of higher temperatures and longer droughts from climate change, combined with already low river flows from upriver dams, will lead to water shortages and allow more saltwater intrusion. Farmers will have to spend more money on irrigation to keep rice fields flooded and salinity in check. Vietnam is acknowledging these climate stresses on agriculture and working to improve adaptive capacity of crops and farming systems. The government is directing some farmers to switch from intensive rice cultivation to integrated systems with more salt-tolerant rice and aquaculture. Shrimp can survive in saltier conditions and can be grown during the dry season, so farmers can have year-round income and food sources. The integrated system is an effort to improve existing farms; however, large-scale shrimp farms are also being developed and some are replacing important coastal forests. Rice is a staple food source that accompanies most meals in Vietnam. 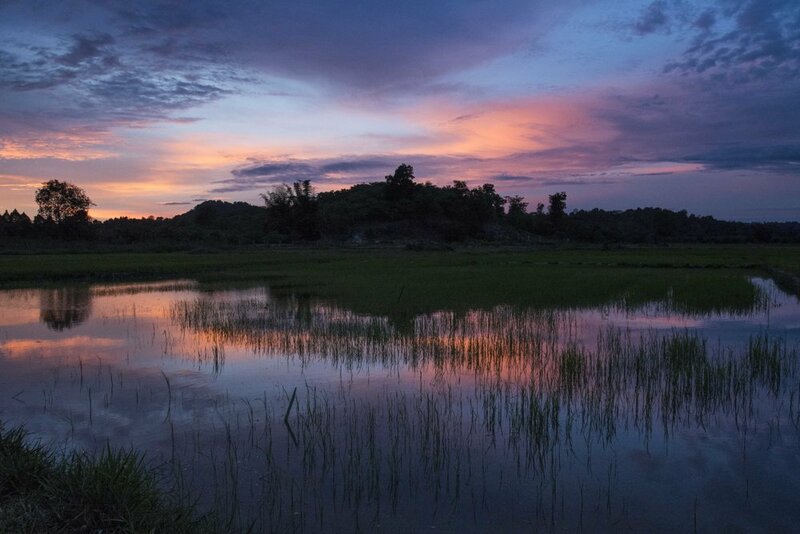 Water is crucial for growing rice but rising temperatures can result in prolonged drought, complicating production. Switching from large scale rice production to smaller ones could improve soil quality and store carbon, both making fields more productive and mitigating climate change. Students walk between rice fields. 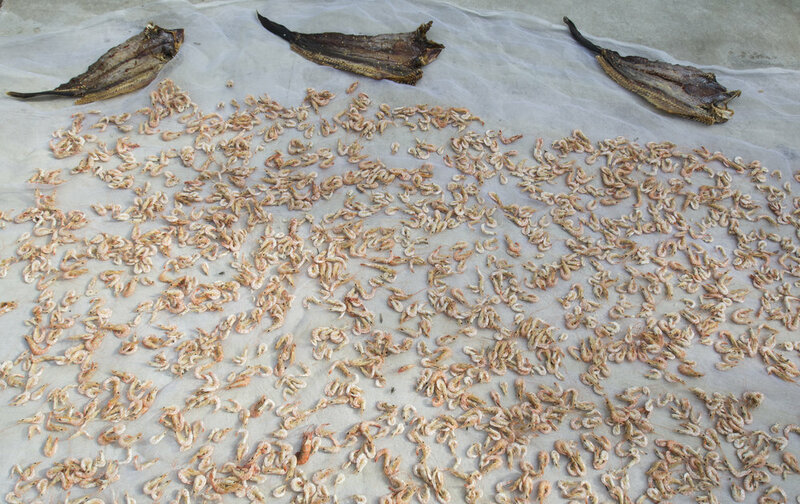 The integration of salt-tolerant rice and shrimp is becoming more common because of salt water intrusion and drought. Trenches around rice fields hold water, allowing shrimp to be raised during the dry season. Mangrove forest ecosystems are critical to the coastal zones of Vietnam because they help to sustain food security and ecosystem function. They also act as storm buffers that prevent erosion during floods by anchoring sediment. One area where these forests are being conserved for their ecosystem services is in Can Gio Biosphere Reserve, an area where chemicals sprayed during the Vietnam War to clear war zones destroyed 20,000 hectares of mangrove forests. Can Gio has an active restoration effort, which we helped with by planting around 40 young trees. As of now, mangrove restoration and conservation in this Reserve has resulted in a significant increase in biodiversity. Nearly 700 species, including catfish, crocodiles, otters, monkeys, shellfish, and invertebrates, now thrive within Can Gio’s mangrove forests and communities. It is critical to sustain coastal forests because of their ecosystem services and ability to mitigate flooding and erosion in Vietnam's coastal and low-lying regions, especially as storm and sea level rise impacts intensify with climate change. In addition, these forests sequester carbon, which helps to reduce the amount of CO2 in the atmosphere that would otherwise contribute to rising global temperatures. Young mangroves are brought to planting locations in Can Gio Biosphere Reserve. We helped the Can Gio Reserve mangrove restoration effort by planting around 40 young trees. The succession of a mangrove forest in Can Gio Reserve. The young trees we planted are in the foreground, with 8-25 year-old trees behind. Fish and shrimp thrive when mangrove forests do. These are important food sources for people living in mangrove ecosystems. This shrimp and oyster farmer is able to live almost entirely off the land because of the mangrove forest. The average American emits an average of 19 mt/CO2 each year. In contrast, the average Vietnamese emits only 2 mt/CO2 each year. Even with a small global impact, however, Vietnam is taking both small and big scale mitigation measures. 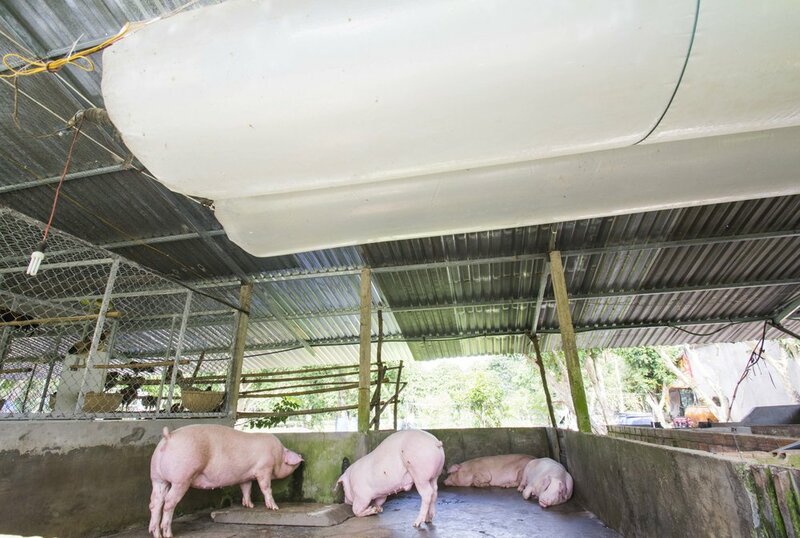 A farmer's biogas system captures methane from pig waste and decomposing vegetation, which is grown on a pond and also provides nutrients for fish. This system powers the family’s cooking stove, satisfies electricity needs, and pumps water to irrigate fruit trees and other crops. It is a renewable energy system that reduces the amount of methane which would otherwise be released into the atmosphere as a powerful greenhouse gas. This farm is a small-scale project, but prevents the release of 3-4 metric tons of carbon into the atmosphere per year, which is as much as we each released by flying to Vietnam and back. 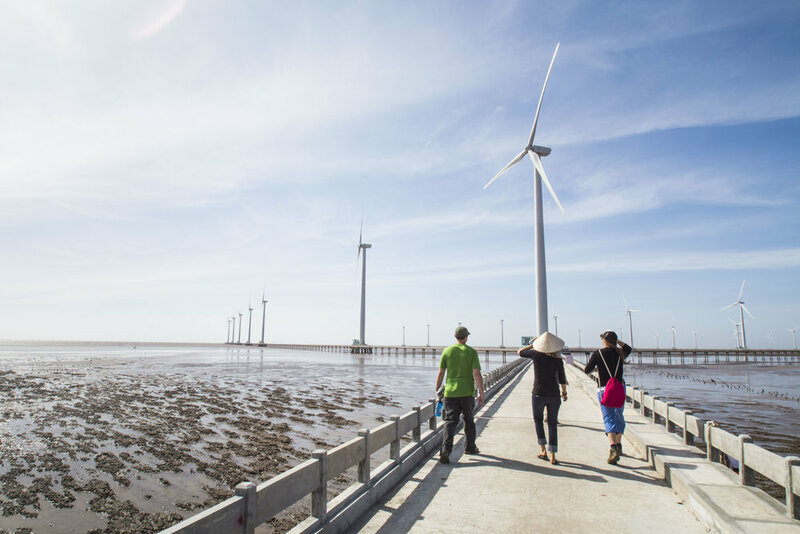 The Bac Lieu offshore wind farm off the coast of Southeastern Vietnam currently has 62 turbines that provide a gross annual electricity output of 335 GWh and offset a total of 151,330 tons of CO2 emissions a year. There are plans to expand the project to integrate even more renewable energy into Vietnam's national grid. Livestock waste releases methane, a powerful greenhouse gas. On this farm, methane from pig dung is collected in tanks and used for fuel. 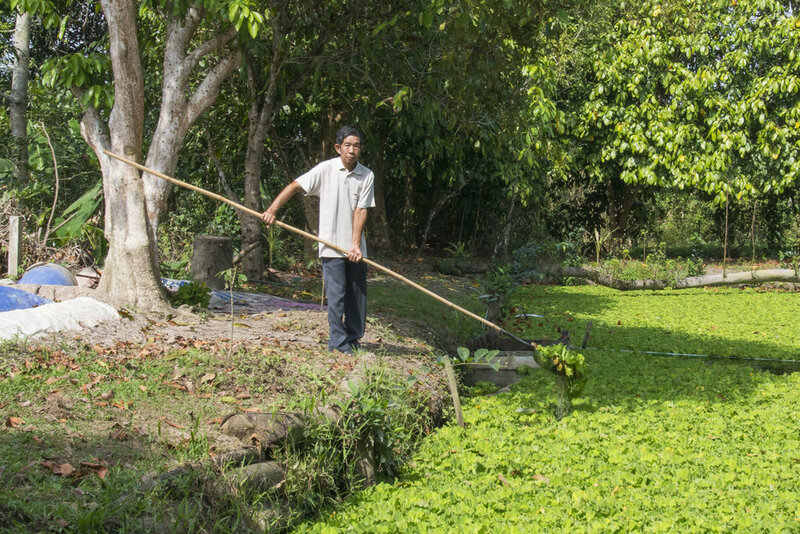 Farmer Than gathers pond vegetation to put into a biogas digester. Like animal waste, decomposing plant material releases methane that can also be captured and used as fuel. Students have a discussion next to a biogas collector. 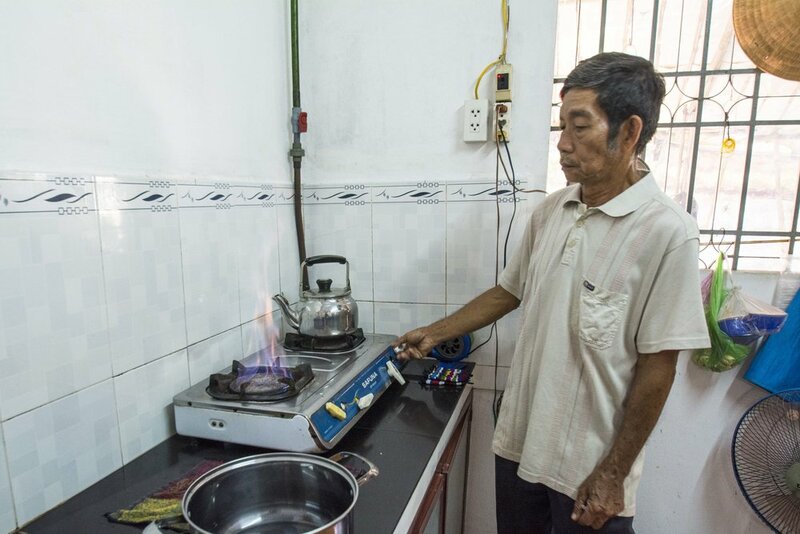 The visible hose connects to the home, powering the cooking stove. Farmer Than shows us how his cooking stove works using the captured methane fuel. The Bac Lieu offshore wind farm offsets a total of 151,331 tons of CO2 emissions each year. Vietnam's largest cities of Hanoi and Ho Chi Minh City have rapidly growing populations. These cities are attractive centers for development, business, entrepreneurship, innovation, youth culture, and education. 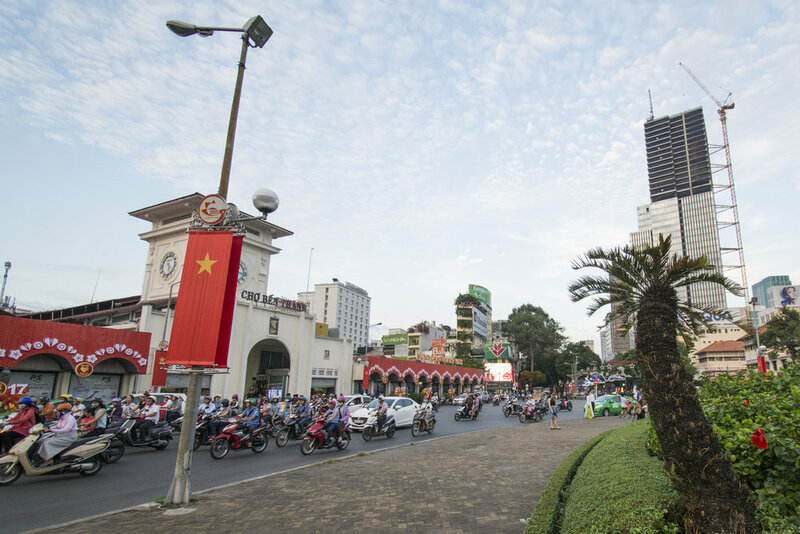 Many migrating to Ho Chi Minh City are people from the Mekong Delta seeking opportunity as the country transitions towards industry and service sectors. The Vietnamese government is expecting greater migration to cities as climate change intensifies and adds stress, insecurity, and uncertainty to agricultural livelihoods. Ho Chi Minh City (formerly Saigon) is the major center of development, entrepreneurship, and innovation in Southern Vietnam. 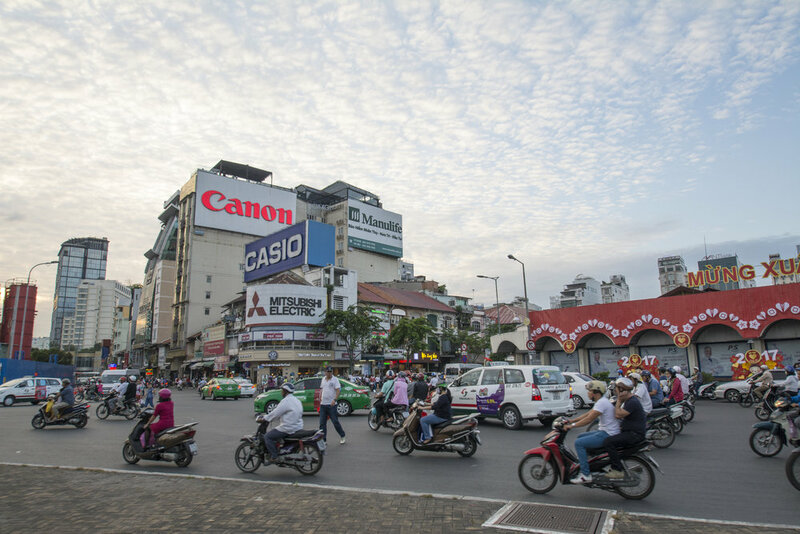 Rural to urban migration is causing Ho Chi Minh City's population (currently around 8.5 million) to increase rapidly, and the streets are constantly crowded with motorbikes and taxis. Unfinished skyscrapers are numerous among the rapidly developing Ho Chi Minh City. We had several opportunities to connect with youth in Ho Chi Minh and Can Tho Cities. While the youth are concerned about the changes they are observing, many are optimistic and thinking of innovative ways to address these changes. It was inspiring to share and discuss ideas and concerns as youth facing great future challenges from global climate change. Being able to build personal cross-cultural connections between our country, a large contributor to climate change, and a country contributing significantly less but forced to deal with major impacts, was a meaningful opportunity. I think these kinds of relationships between younger generations around the world are important to develop, as we are next in line to tackle the escalating environmental crisis. I hope this story helps extend both the connections I discovered between the people and environment of the Mekong Delta and the importance of building relationships between young generations from different countries. I also hope it helps inspire collective desire to sustain both our planet and the livelihoods of all global citizens. I would like to thank the Davidson Honors College, the Maureen and Mike Mansfield Center, ASUM, and the W.A. Franke College of Forestry & Conservation Franke Sustainability Fellowship for supporting this trip, project, and exhibit. Special appreciation goes to Dr. Nicky Phear, leader of the Vietnam program and a valuable mentor. Additional thanks to Tamron USA for gifting me a wide angle lens that allowed me to capture the majority of images featured in this story.